Design and make your own artwork using traditional hand tools, inks and techniques in woodcut art. 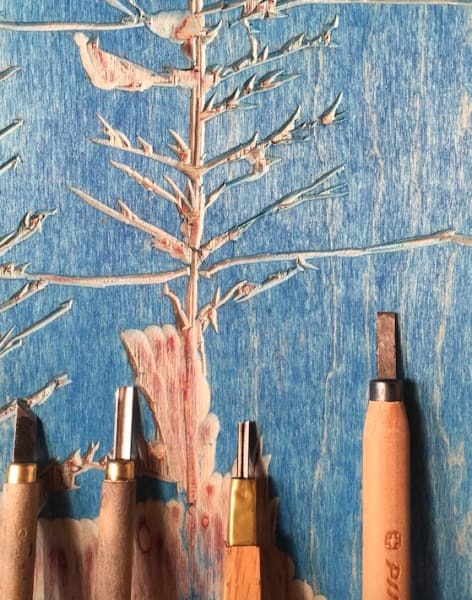 The 7 hour workshop day will comprise of producing woodcut prints using ancient techniques. Alex will teach the fundamentals of the practice including; block registration, reduction cut printing and how to produce images made of multiple colours. 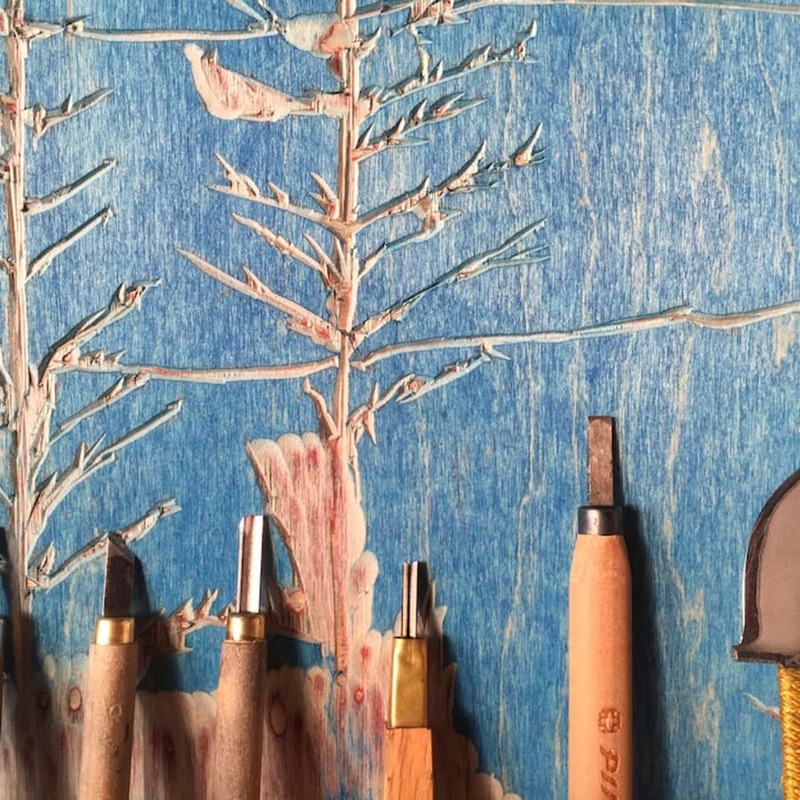 Stage 1 - The workshop will cover the use of tools to design, draw and cut woodblocks and explore the process of hand printing using barens and rollers on three types of paper. Stage 2 - Delve a little deeper, showing you how to use multiple blocks and reduction cutting techniques to create more complex multi colour prints. At lunchtime whilst delicious food is served, Alex will give a presentation on the history of woodblock printing, originating in China in antiquity as a method of printing on textiles and later paper. The famous Ukiyo-e period in 19th century Japan, 20th century images form Mexico and the German Expressionists as well contemporary artist working in the medium will be discussed and celebrated. Woodcut is the oldest the oldest known recorded print and the first method of visual communication to the masses. Alex was an extremely interesting and helpful teacher who made me feel welcome. He was very passionate about printmaking. 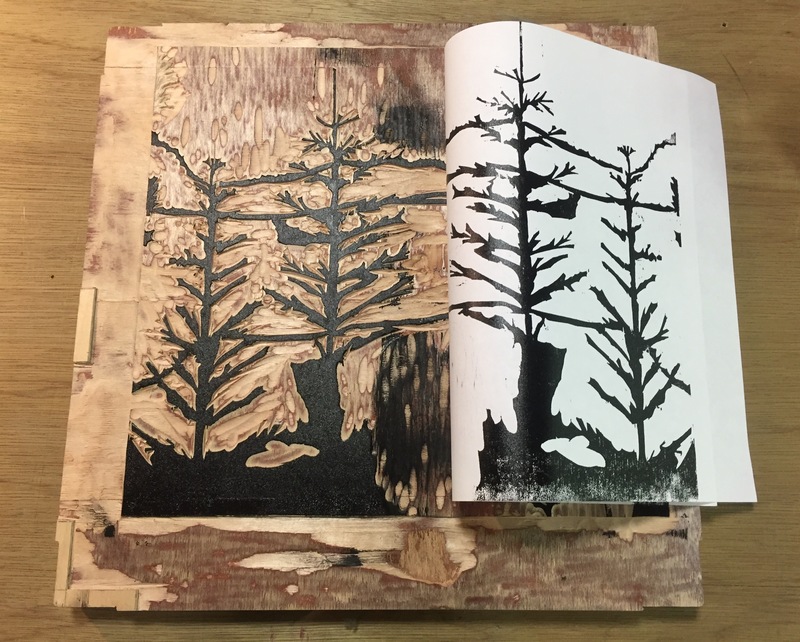 This made learning the techniques and making my own woodcut print an enjoyable and entertaining process. Alex was an excellent host who made a tasty lunch (and I am fussy eater). Already the caringly prepared vast and healthy brunch buffet is worth a visit! Alex runs his course in a highly flexible way, providing book references with those who struggle for ideas, advising each participant on their personal projects and ideas and even teaching “registration” for those who want to take it to the next level and even do multicolour/multilayer woodcut prints. Surrounding by his own extraordinary partially large-scale work in a studio full of light the space is very inspiring. One can even occasionally watch Alex working on his own art during some of the breaks, which helps very much with ideas and learning. Alex Booker runs Booker Print House from his studio in Limehouse, East London. 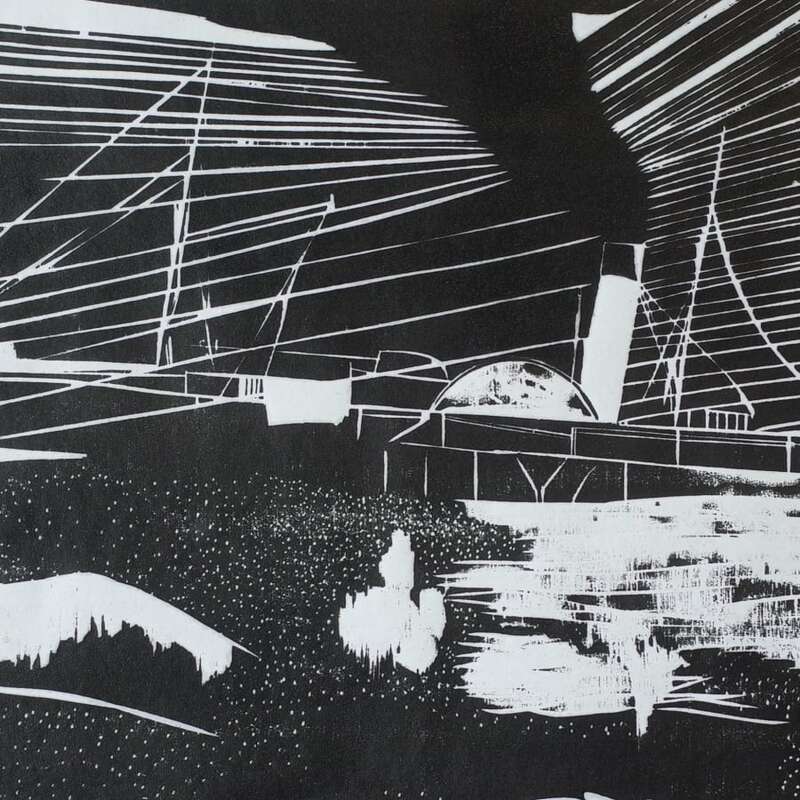 As a practising artist for the past 10 years, Alex exhibits his prints internationally and loves teaching the ancient art form of woodcut printmaking. He believes anyone with the right guidance and environment can learn to make art. Confidence, curiosity and those wanting to play will enjoy the day so much and produce their own unique artworks. The class starts with a cuppa of course and you'll be introduced to the tools, ink and blocks. This will be pretty quick as Alex will be keen for you to start and will talking and demonstrating techniques throughout the day. Do you have any dietary requirements? There will be snacks and a light lunch to keep all your energy levels up - but let Alex know if you're a vegetarian, vegan, gluten intolerant etc and he will try his best to make sure there's a selection of food that you can eat. Also, tea, coffee, and cordial drinks will be aplenty. The studio will be quite messy with inks and wood shavings, so it is recommended you not wear your 'Sunday best’, anything you don't mind getting a little dirty and is easy to work in. Free parking is available at the studio block. If you have anymore questions, please don't hesitate to ask. Alex recommends bringing anything that may inspire you or material that is part of an on going project you might be working on or just something visual that makes you happy. He often works with photographs, postcards, drawings, film stills and patterns. Do you have any dietary requirements? There will be snacks and a light lunch to keep all your energy levels up - but let Alex know if you're a vegetarian, vegan, gluten intolerant etc and he will try his best to make sure there's a selection of food that you can eat. Also, tea, coffee, and cordial drinks will be aplenty. The studio will be quite messy with inks and wood shavings, so it is recommended you not wear your 'Sunday best’, anything you don't mind getting a little dirty and is easy to work in.